Chanticleer: A Botanical Distraction From Daily Life The Chanticleer estate in Wayne, Pa., is 37 enchanting acres open to the public. "It's music, it's ballet, it's cinema," writes one garden critic, "the garden as an art form." Chanticleer is a historical estate and garden in Wayne, Pa., part of the old Main Line ring of estates around Philadelphia. Purple allium varieties scatter a central bed. 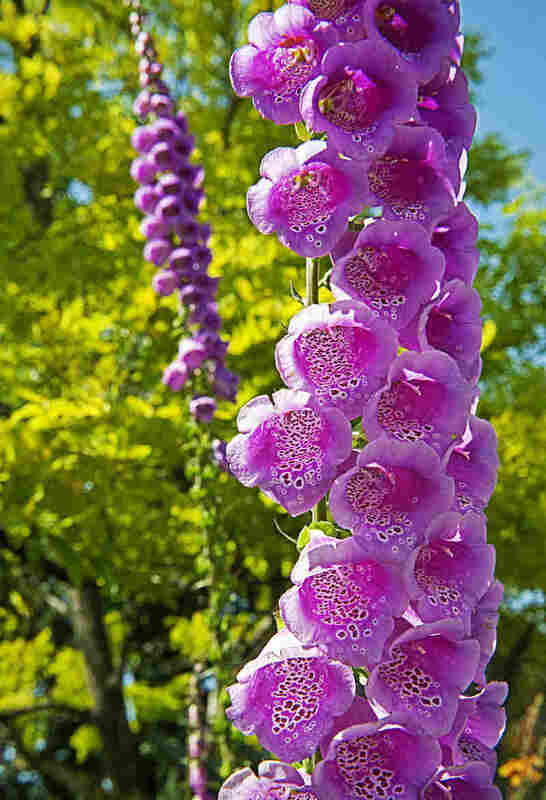 Naturally grown in woodland shadows, Excelsior Hybrids foxglove stand on display close to the garden's entrance. Shrubbery lines the roofless stone walls of the Ruin. A closeup of one of the many plant varieties featured throughout the gardens. 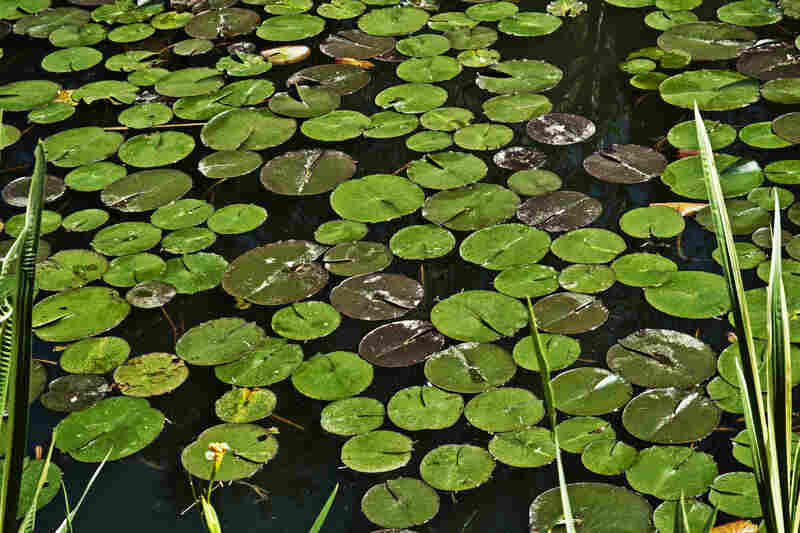 Pond lilies float in one of the cascading bodies of water in the Pond Garden. Ever wanted to just disappear into a secret garden of earthly delights, of twists and turns of evocative ruin, exuberant tropics, the Zen of a Japanese teahouse? Consider Chanticleer, in Wayne, Pa. It's part of the old Main Line ring of estates around Philadelphia. In fact, right across the street from the garden is the former home of Helen Hope Montgomery Scott, the heiress portrayed by Katherine Hepburn in Philadelphia Story. 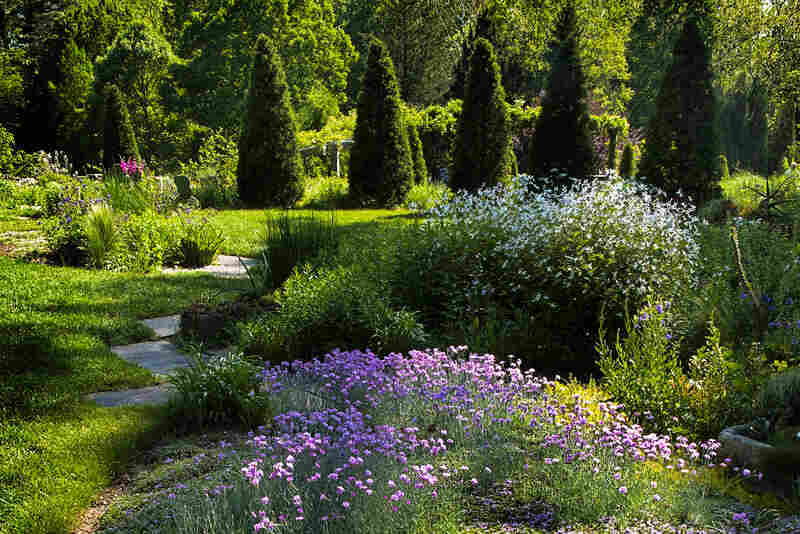 Chanticleer is, quite simply, one of the most delightful gardens in the world. 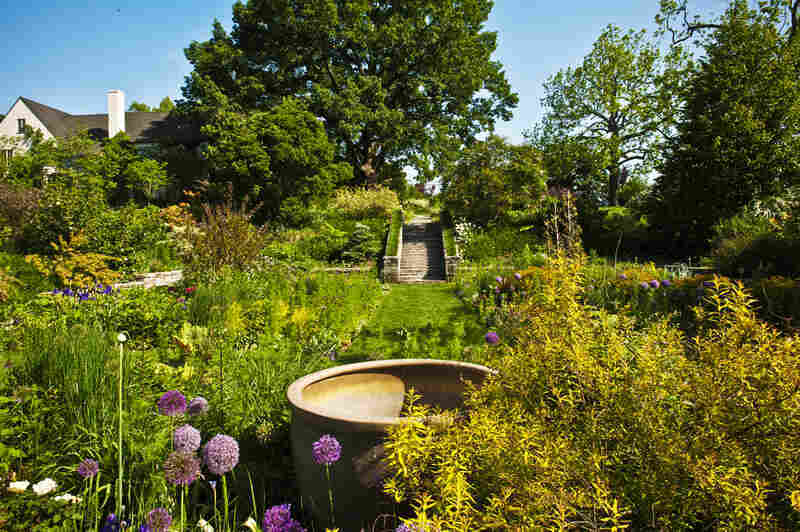 In Chanticleer, a Pleasure Garden, Washington Post garden critic Adrian Higgins writes that one of the things he likes best is that "it doesn't have an agenda. It isn't, for example, only native plants. It doesn't label everything, like an arboretum. It's about plants; plants on their stage." "It's music, it's ballet, it's cinema, the garden as an art form," he writes. More directly: It is 37 enchanting acres open to the public, meant to distract us from the care of our daily lives. Adolph Rosengarten Sr. and his wife, Christine, bought the property that would become Chanticleer in 1912. Rosengarten headed a Philadelphia pharmaceutical company, Rosengarten and Sons, which would eventually merge with Merck. 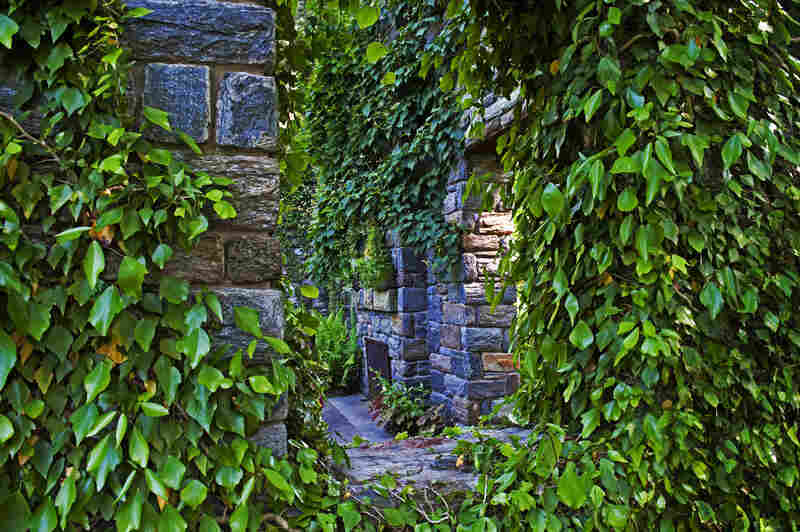 He expanded the property, but it wasn't until Adolph Rosengarten Jr. came home from World War II that the garden really began. During his time stationed at Bletchley Park in London, Rosengarten Jr. fell in love with English manor gardens. Over the decades, "Dolf Jr.," alarmed by development in the area, saved the land he loved by creating a foundation and trust for Chanticleer. Chanticleer opened to the public in 1993. The name? Maybe for the "rooster" emblem of France. When he died in 1990, he left Chanticleer as a bequest that all could enjoy. The bequest was a selfless act. He could have done anything with the property; what he wanted was for visitors to wander the grounds and recover from the woes of the world. In his days, it was lawns and trees. Today, the gardeners wonder what he would think. First, they say, he would be shocked; it's so colorful. They hope he would approve. Chanticleer's two executive directors, Bill Thomas and Chris Woods before him, added color, hot plants, artistry, wit and savvy. They have sent gardeners all the way to Japan to figure out how to build a teahouse. For 10 bucks, a visitor can roll down a hill below the vistas of a 1920's great house. You can stop at the Teacup Garden in the entryway, then sit on a bench and read a book beneath towering banana plants that seem like Doric columns. From the minute you arrive, your eye is entranced by the Parking Lot Garden, meant to whisk your eye into the grounds. But the favorite, for many visitors, is the Ruin Garden. Built to resemble the house where the younger Rosengarten lived, the Ruin looks like a Tim Burton set, the "ruin" of a roofless mansion. A 24-foot-long sarcophagus-like table of polished black granite holds a burbling pool beneath a towering fireplace "chimney." Sedums ring a mantelpiece "mirror." Weeping cypresses appear to be ghosts. Stone furniture is set nearby, outside, as if the "family" living in the Ruin had to flee. It's all a botanical stage set. 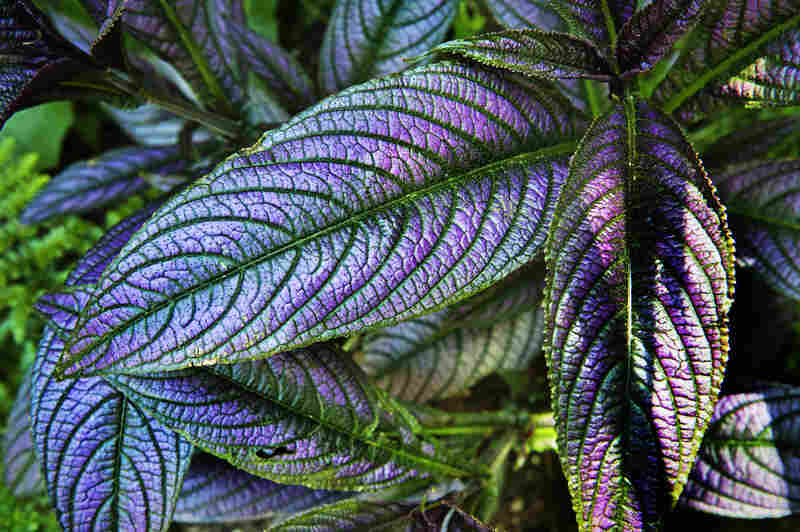 If you are a plant geek, fine. Whimsical "plant list" boxes built by the staff give you access to what's growing on the estate. Otherwise, you are allowed to wander, as Alice once did in Wonderland.